About the 2016 Honda Accord LX Trim: What Does The LX Trim Come With? From everyday commuting to tackling family holidays to impressing clients and colleagues, the 2016 Honda Accord LX runs the gamut of responsibilities required by Goshen and Monroe drivers. Fitted with a strong selection of standard features and a powerful engine beneath the hood, it’s an entry-level trim level that feels like anything but. Many entry-level sedans offer substandard power, but the 2016 Honda Accord LX just doesn’t play that way. Instead, you’ll be able to command up to a generous 185 hp and 181 lb-ft of torque right off the bat thanks to a 2.4L four-cylinder engine. You’ll then be able to choose between two refined transmissions. 6-Speed Manual: Some drivers like the precise control provided by manual; they’ll make up to 23 mpg in the city and 34 mpg on the highway* with this transmission in an Accord LX. Continuously Variable Transmission (CVT): Other drivers like their vehicle to do all the shifting for them; thanks to CVT, they’ll make an incredible 27 mpg in the city and 37 mpg on the highway* in an Accord LX. Horsepower and torque are responsible for providing a responsive and engaging drive, but it’s a sedan’s features that often matter most to Goshen and Monroe families. 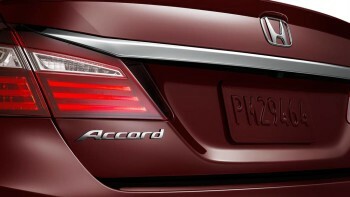 Honda has answered that need by providing plenty of amenities in the 2016 Accord LX, enhancing everything from comfort to connectivity to entertainment. Bluetooth HandsFreeLink: Since staying connected on the go is more important than ever, the Accord comes with Bluetooth as standard, and there’s even an SMS texting function that can read your incoming messages aloud. Speed-Sensitive Volume Control: Lets you sit back and enjoy your four-speaker, Pandora-equipped sound system. Dual-Zone Climate Control System: Both the driver and front-passenger can select their own temperatures. The LX is also one of the only entry-level sedan trims that is available with the advanced driver-assistance technologies listed below – such options are usually reserved for the most expensive models. 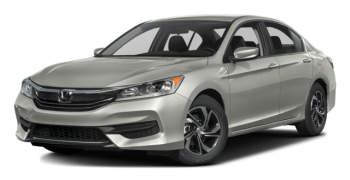 The 2016 Honda Accord has been one of America’s most popular vehicles for decades, and the Accord LX proves that this legendary line hasn’t come close to losing its touch. If you’d like to learn more about this enticing model near Goshen and Monroe, just contact Middletown Honda.